With the evolution of taste, social attitudes, industry practices and so on, horror today bears little resemblance to classical movie horror … and viewers today would have a really hard time being scared by things which apparently did terrify audiences of the past: like Universal’s original Dracula and Frankenstein in the early ’30s. We appreciate them today for their nostalgic charm, their wit and, in an odd way, their innocence (or rather, our own lost innocence). There were always a few films back then which reached deeper into areas which still have the power to disturb – Edgar G. Ulmer’s perverse The Black Cat and Erle C. Kenton’s equally perverse Island of Lost Souls, for instance, both of which delve into areas of psychopathology rather than morality, making them less conservative than the general run of Golden Age horror films. These films, despite being anchored in the techniques of their time, remain fresh and surprisingly modern. It is often this psychological element, rather than monsters (or today’s often tediously graphic violence), which make for lasting works of horror, works which tend more to disturb than to scare in the make-us-jump manner. Which is why films like Jack Clayton’s The Innocents and Robert Wise’s The Haunting can still creep an audience out … and why a film like Jennifer Kent’s The Babadook stands out so starkly from the contemporary horror field. It was this psychological element which distinguished the best of Roger Corman’s AIP period horrors in the ’60s, films which evoked a clammy air of dysfunctional personality rather than visceral scares (though they did occasionally include those). If the Corman/Poe features starring Vincent Price don’t have the stature of a Black Cat or Island of Lost Souls, that’s no doubt due to the undeniable scent of camp arising from Vincent Price’s rather theatrical style (which is what gives those films much of their lasting value for fans). The best of these films, The Tomb of Ligeia (1964), is the centrepiece Shout! Factory’s second Blu-ray set of Price horror films. The final film in the cycle, and the second to be shot in England, Ligeia is both the culmination of and a departure from the series of movies which began with House of Usher in 1960. Corman had until this point kept these films almost entirely in-studio, feeling that the claustrophobic, literary element survived best in a closed, constructed environment. With Ligeia, two things changed: first, being in England with its landscapes and ruins steeped in history, enticed him out on location, opening the film up and adding a greater sense of realism which gave more edge to the necrophiliac undertones; and second, the script was written by Robert Towne, a writer who was less bound to the literary tone of the source material than Richard Matheson and Charles Beaumont. Of all the Corman/Price/Poe features, Ligeia is the one which is least distanced from the audience by the devices of Nineteenth Century melodrama; despite the period setting, it feels much more modern and gives Price his best role since the creepily hypersensitive Roderick Usher. Although the absence of Ligeia from Shout!’s first Price set seemed like a missed opportunity, it turns out that it was probably a good decision by the company because the film anchors a generally much weaker selection of titles this time out. Which is not to say that volume 2 doesn’t offer a lot of pleasures – just that it’s less coherent and certainly more ragged in terms of quality. Of the seven films, three (including the two earliest) are black-and-white and made on lower budgets; there’s more emphasis on comedy and three of the films have more or less contemporary settings. 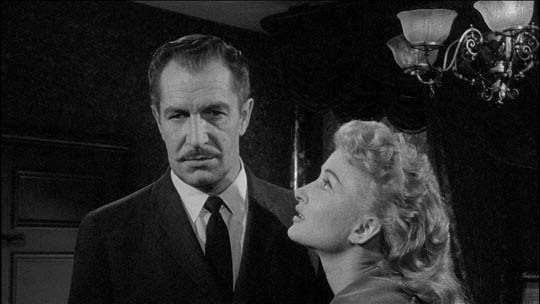 Both William Castle’s House on Haunted Hill and Edward Bernds’ Return of the Fly were released in 1959, the year before Price’s fortunes blossomed through his association with Corman and Poe. Written by frequent Castle collaborator Robb White, House is one of the showman-director’s most entertaining films with, at its core, a deliciously acidic marital relationship between Price’s Frederick Loren and Carol Ohmart’s bored and contemptuous wife Annabelle. The creaky plot involves a “party” to which a seemingly random collection of people, unknown to each other or to the Lorens, have been invited in a reputedly haunted house. Castle’s masterstroke was in eschewing a gloomy Gothic mansion and setting the film in a modernist residence designed by none other than Frank Lloyd Wright (at least that’s what he used for the exterior; the interior is more conventional). As part of the ghoulish fun (which rests on the challenge to everybody to remain in the house overnight with a big reward for those who can take it), Loren gives everyone a loaded pistol. There’s a lot of running in and out of rooms, spooky encounters in the basement, apparent ghosts and murders … and, naturally, a vat of acid into which someone is bound to fall before the dawn. It’s all high-spirited nonsense, not in the least scary, but the byplay between Price and Ohmart makes it thoroughly enjoyable. Return of the Fly, written and directed by Bernds, was aimed at cashing in quickly on the previous year’s success of Kurt Neumann’s original adaptation of George Langelaan’s short story (scripted by none other than James Clavell, years before his successful career as a popular novelist). Although obviously set in pretty much the same period as the original, the sequel has the now-adult son (Brett Halsey) of inventor Andre Delambre learning the truth about his father’s death and his mother’s madness and rebuilding the teleportation machine with inevitable tragic results. Shot in black-and-white rather than colour, the film lacks the gravitas of the original, with a more ridiculous fly-head design and the addition of a man-hamster hybrid. The movie clips along through its absurdities, with Price relegated to a supporting role as the uncle who observes young Philippe’s inevitable fate (brought on by an opportunistic assistant who wants to steal the machine’s secret and sell it to some unscrupulous agents). More interesting than either film (though not necessarily better) is the first adaptation of Richard Matheson’s I Am Legend, shot in Italy and released in 1964 as The Last Man on Earth. Although Matheson had his name taken off the film as scriptwriter (he’s credited as Logan Swanson) because he disliked the results, this sombre film remains the best adaptation of the novel (remade in 1971 by Boris Sagal as The Omega Man and in 2007 by Francis Lawrence under its original title, I Am Legend). Despite the limited budget, The Last Man on Earth evokes an apocalyptic vision of a dead world and the encroaching despair of the man who believes himself to be the lone survivor of a global plague which has turned many of the dead into – well, something like vampires or zombies, who every night lay siege to his heavily boarded-up house. By day, Robert Morgan scours the city for dwindling supplies while also seeking out the sleeping undead whom he dispatches with wooden stakes. In flashbacks we see the deadly progression of the disease (Morgan’s child, then his wife succumb), while he works in a lab trying to find an antidote; society begins to collapse; in the most nightmarish sequence, Morgan races after the death wagons to a vast pit where the bodies are burned, trying to find his dead wife. If the film is rather plodding and unimaginative, sequences like this generate a chilling atmosphere. 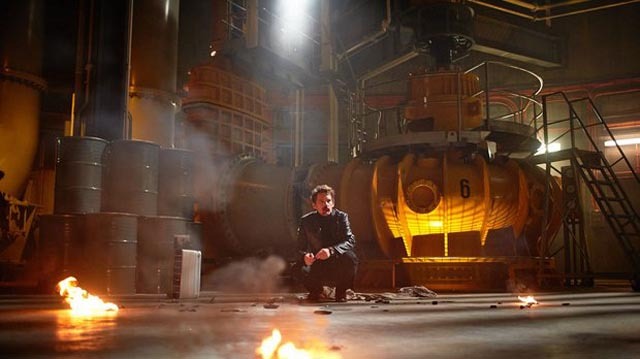 As in the novel, it gradually becomes apparent that in this transformed world, Morgan himself has become the monster, a predatory killer destroying what has now become a new lifeform. Director Ubaldo B. Ragona, whose only “major” credit this is (with an uncredited assist from Sidney Salkow), may not be any kind of stylist, but the film maintains a consistently grim tone which makes it a worthy representative of the apocalyptic horror sub-genre. The year before Price followed Corman to England for their two biggest Poe adaptations, the actor made a pair of comedies for AIP which seemed at the time to indicate the last gasp of the Poe cycle. Corman obviously had a great time sending up his own series with the almost slapstick The Raven in which the star, accompanied by a very impish Peter Lorre, heads for the castle of sinister magician Boris Karloff, who may be holding Price’s supposedly dead wife prisoner. As it turns out, the late, lamented Lenore (voluptuous Hazel Court) is actually an opportunist who was attracted by Karloff’s greater position in the magician hierarchy. A magical duel ensues, displaying the most elaborate effects in the entire series, with snappy dialogue flying as furiously as fireballs. The overall tone of the film (scripted by Matheson) is good-natured, sending up the Poe series with affection. Generally considered less successful is the same year’s The Comedy of Terrors, again scripted by Matheson, but this time directed by the great Jacques Tourneur towards the end of his career (he made only one more feature, 1965’s City Beneath the Sea). Tourneur was not known for his comedic sensibility and a lot of people feel that he was an inappropriate director for this project and in a sense his more elegant, less freewheeling style does perhaps subdue the humour – certainly in comparison with Corman’s work in The Raven – but I’m not sure that Matheson’s script about the greedy, immoral undertaker Waldo Trumbull (Price) and his schemes for drumming up business with his reluctant assistant Felix (Peter Lorre), who is in love with Waldo’s buxom opera-singing wife Amaryllis (Joyce Jameson), would have benefited from a more knockabout style. By keeping the slapstick elements under a tight rein Tourneur prevents the characters from becoming too cartoonish. The byplay between Lorre and Price is entertaining and Basil Rathbone is a very funny presence as the miserly landlord who proves very difficult to kill. The final, and least of the films in the set is Robert Fuest’s follow-up to 1971’s The Abominable Dr. Phibes. Made the following year, with a script by Fuest and Robert Blees, Dr. Phibes Rises Again was a compromised production, with its producers wanting merely to emphasize a series of bizarre deaths rather than elaborate on the doctor’s story. This script interference, combined with friction between Price and co-star Robert Quarry (who later admitted that his ego got in the way of giving Price due respect), resulted in a misfire which repeats the Deco design and the general structure of the first film, but without a compelling narrative. 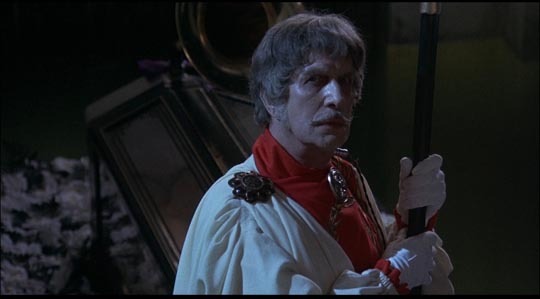 Phibes, revived years after his self-embalming at the end of the first film, finds himself in a race with Darrus Biederbeck (Quarry) to find a particular Egyptian tomb where, with a sacred scroll and a rare astronomical confluence, he will be able to restore his beloved dead wife to eternal life. Along the way, there are a number of elaborate deaths of secondary characters, but the whole thing seems like a tired retread. Shout!’s Blu-ray set presents all these films in excellent HD transfers, along with a number of featurettes and commentaries. All of these films adhere to the classical narrative style. A couple of more recent movies are shaped more by modern technology – i.e. the ubiquitous presence of cameras, which first began to reshape the genre with The Blair Witch Project (1999). It’s virtually impossible to make a horror movie today without foregrounding this presence and dealing to some degree with the unreliability of vision. John Erick Dowdle’s As Above, So Below (co-written with his brother Drew, with whom he also worked on the unnecessary Quarantine, a remake of Jaume Balaguero’s [Rec]) pushes the exhausted found-footage form to its limits, the jumpy style becoming more irritating than scarily immediate as it goes on, but the film almost satisfies on the strength of its concept – though it ultimately fails to fully develop that potential. Scarlett (Perdida Weeks) is an academic obsessively determined to vindicate her father, who committed suicide, apparently because his own obsession with finding the legendary alchemist’s Philosopher’s Stone drove him mad. When she gets wind of the Stone’s location somewhere far beneath the streets of Paris, deep in the miles of catacombs under the city, she drags a reluctant friend and a team of French urban explorers along on her quest. 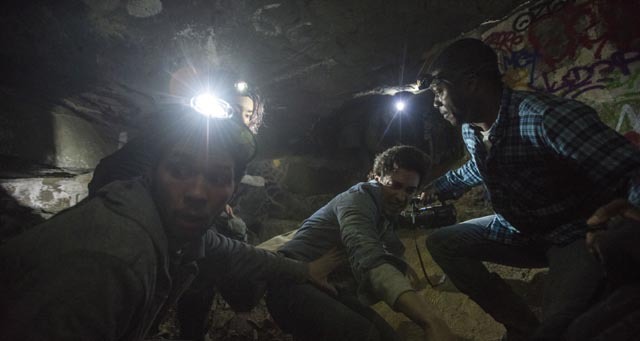 The film relies heavily on the claustrophobic locations – endless tunnels full of bones – and increasingly frequent glimpses of spooky things like ghostly figures and what looks like some kind of Satanic Mass. As they get closer to the secret chamber where the stone has supposedly been hidden, members of the group begin to die and space itself seems to start warping. There are atmospheric moments, but the underlying mythology isn’t developed beyond its initial set-up and the shaky-cam’s refusal to permit us a clear look at anything which is happening plus the script’s vagueness about narrative details end up producing more frustration than scares. Mike Flanagan’s Oculus (he co-wrote and directed) is a much stronger film, with a confident control of structure and tone. It starts with Tim Russell (Brenton Thwaites) being released at 21 from a psychiatric hospital where he’s been held since he killed his father at age 10. He’s met by his sister Kaylie (Karen Gillen), who immediately starts to undermine his fragile, hard-won sanity by trying to force him to remember what really happened that night eleven years earlier. He reluctantly joins her in returning to their old home where she has set up an elaborate system of technology to observe and prove what she insists are supernatural events revolving around an antique mirror. The film intercuts between the past – the family’s move to the house, the gradual possession of their father by whatever haunts the mirror, the encroaching madness of their mother, and the final night of murderous violence – and the present, in which Kaylie seems to become more and more unhinged and Tim’s grip on his sanity becomes more tenuous as he struggles to fight off what he at first insists are her false memories. Oculus is intense and creepy, with the mirror able to distort the siblings’ sense of reality, playing on their fears and weaknesses and manipulating them towards a brutal climax. “Evil wins” has become something of a cliche in the decades since Hollywood stopped insisting so determinedly that it must always lose, and sometimes it would be nice for characters’ efforts to defeat the monster to succeed, but Oculus follows the logic of its own conception to an inevitable conclusion … and stands as one of the best-realized of recent horror films. Although it doesn’t actually count as horror, the Spierig Brothers’ Predestination turns out to be one of the most satisfying genre films to come along in a while – even though it perhaps shouldn’t work at all, given that it’s essentially 90-minutes of exposition delivered in long, talky scenes on just a few sets. I didn’t particularly like the Spierigs’ first feature, Undead (2003), its zombie comedy seeming like a pale imitation of Peter Jackson’s early work. But I’m a big fan of their original and inventive Daybreakers (2009), an imaginative rethinking of vampire lore, so I was interested in taking a look at Predestination (2014), an adaptation (surprisingly faithful) of Robert A. Heinlein’s time-travel paradox story All You Zombies. This story of a time-traveling agent, The Bartender (Ethan Hawke), and his involvement with The Unmarried Mother (Sarah Snook), whose life story makes up the bulk of the film, is elaborately twisted, with a mind-bendingly perverse paradox at its centre, which is too good to spoil here. Suffice to say that the intricacies of the story make for the best time-travel movie since Nacho Vigalondo’s Timecrimes (2007), which in turn was the best since Shane Carruth’s brilliant Primer (2004). Although not overtly horrific, Predestination is sufficiently disturbing to warrant a look from horror fans. This entry was posted in Commentary, Review and tagged Actors, Blu-Ray, Directors, Horror, Science Fiction. Bookmark the permalink.